Spiel proved to be an incredible experience, with attendees in the tens of thousands strolling through the doors and weathering the crowds. Some days, you could hardly shuffle for the press of people – and somehow the days flew by. I had the chance to meet so many existing customers of All Rolled Up and Just Crunch Games, while also introducing many, many more to our products. I think “It’s a fast-to-learn horror investigation roleplaying game that you can read in 20 minutes, explain in 5, and generate characters in 2.” must have tumbled through my lips hundreds of times. Having said that it takes 5 minutes to explain, I proved it time and again. I had to get it down pat because I doubted my voice would last the weekend otherwise! I had the chance to speak to a lot of people who have played other Cthulhu-themed games in the past and most walked away with a slim black box. The addition to the explanation here was that all your existing material works fine with The Cthulhu Hack – as skills in Call and Trail broadly come down to search for things or speak to people, and anything else is a response to threat. I have done conversions on the fly with no prep at all — although, I think to get the best payback it’s worth reading through an adventure once and highlighting potential clues from the outset. 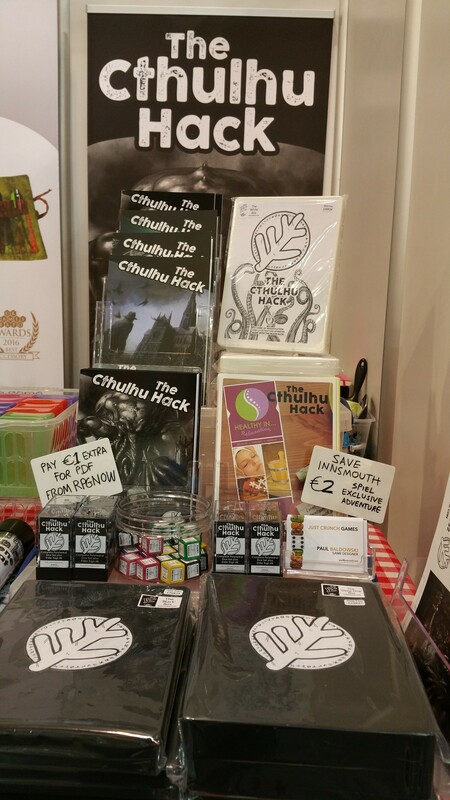 The slim black boxes sold the best, packed with all the current books for The Cthulhu Hack. It feels nice and hefty and worked out at 26 euros including the new adventure, Save Innsmouth. I got a lot of smiles when I explained the premise of Save Innsmouth – and James Raggi commented that he liked the cover image. I wanted to get an innocuous image on the front with Innsmouth clear and legible. Anyone with a fate idea of where and what Innsmouth is immediately smiled. I sold about half of the physical copies of the adventure – which means I will have stock for the web site at All Rolled Up and Dragonmeet, all being well. I’m also really pleased that I’ve managed to sell 50 copies of the adventure through RPGNow. It would be nice to go Copper in the first week — so, if you haven’t picked it up, you can grab a copy through RPGNow and DriveThruRPG. If you have anything to report about the adventure or just want to help promote it, remember to tag your post — anywhere — with #SaveInnsmouth and I’ll track it down! Also, and finally, Lulu has a coupon — NIGEL35 — which means you can pick up a physical copy of The Cthulhu Hack on Lulu at 35% off.